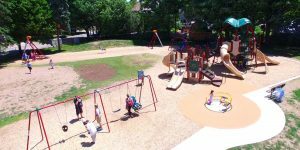 Prospect Park in Acton has a fantastic combination of play equipment that children love. A few highlights are the Mantis Zipline, the Wheelchair Inclusive Spinner, the best Inclusive Swing Seat, and a skill building play structure. Check out the video to see it in action – Acton Part 2 ! For more information call your local PlayPower Canada representative at 1-800-265-9953.